Fred Gregory fashions a foot on a pot while it spins on a wheel. 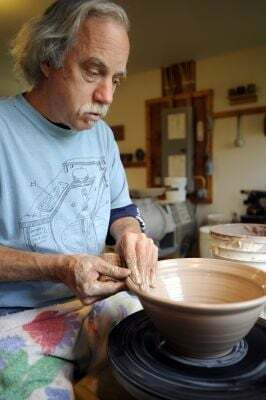 Fred Gregory, owner of Bristol Pottery, finishes the rim of a vessel as he demonstrates the art of throwing a pot on spinning wheel. Fred Gregory, owner of Bristol Pottery, shows off samples of his finished ceramic artwork. Fred Gregory, owner of Bristol Pottery, shows visitors the kiln he made by hand. After more than 36 years, Fred Gregory is still so enamored of his vocation that he speaks of it with wonder. Gregory is the owner and artist in residence at Bristol Pottery. He makes pottery, from functional dishes and bowls to more esoteric sculpture, in a studio he built outside his home. Inside, he throws pots with clay he mixes himself and glazes he makes with natural substances like wood ash from his fireplace. The pottery is fired in a brick kiln he built by hand. Gregory, 61, was in his 20s and working as an engineer in Illinois when he decided to take a pottery class at the College of Lake County. 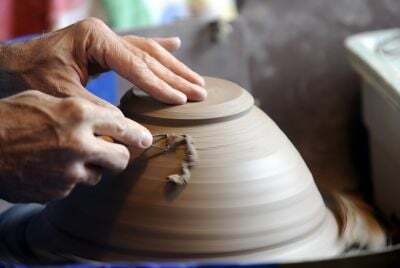 In class, he sat down at the pottery wheel and began to work the clay in his hands. “And I made a pot. It wasn’t very good. But I was so excited I jumped up and yelled,” he said. Using the dishes and bowls produced by other artists at his home taught him another lesson, he said. Life seemed richer when he and his family were using everyday objects made by hand. Gregory likes to tell a story about his wife and daughters complaining that too many bowls were beginning to clutter the kitchen. At their urging, he stacked 10 or 12 bowls next to the door to the basement, planning to take them downstairs later in the day. When he returned, he found all the bowls returned to the kitchen. Each member of the family, it turned out, had favorites among the pieces of pottery they could not part with. “I even love to wash the dishes, because then I get to touch the pots,” he said. Gregory and his wife Liz moved to Bristol seven years ago after their two girls graduated from high school in Illinois. The couple were looking for a place where Gregory could build a home and found that zoning regulations in Illinois would not allow his business and home on the same property. North of the state line, they found what they wanted. Outside his Bristol home, Gregory built the shop, built the brick kiln without using mortar, and designed a showroom. In his career away from his studio he worked as an engineer, and he brings an engineer’s exactitude to the shop, with all his ingredients and supplies carefully labeled. Most of the work he creates — from thigh-high vases to bowls that fit into the palm of a hand — are made for practical, everyday use in the home. But there is whimsy too, including garden sculpture. He finds his inspiration in the work of other potters, in historical works, and in the trees and stones he finds on his property. Gregory does about four kiln firings each year, the shed-sized kiln packed with hundreds of pieces each time. He is never exactly sure how his work will look when it emerges from the fire. “It’s like Christmas when you open up the kiln,” he said. Now retired from his day job, Gregory sells his wares mostly to a local following from his shop, and at a few art shows during the year. He sees his sales not so much as a money-making venture but as a way to ensure he can continue to work with clay. The more pots he sells, the more he can spend time creating.